Firstly, to prepare the glaze, mix the soy, tequila and cider vinegar, jalapeno and the sugar in a small bowl and set aside. Preheat the oven to 180°C. Cut off the tip of the drumstick. Place the meaty pieces on a baking sheet lined with aluminium foil. Season the chicken. 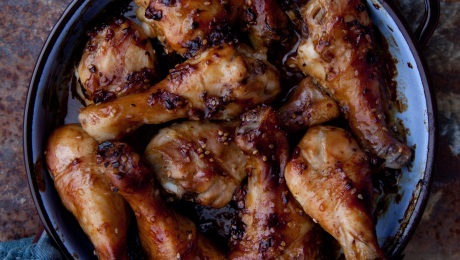 Place the drumsticks in the oven and cook for 15 minutes on each side until nearly cooked. Then, generously baste the glaze on the chicken, and bake for another 10 minutes until the glaze begins to bubble, remove from heat and let sit for 2 minutes. Garnish with sliced spring onions and sesame seeds.